As part of Dark Matter Publications and in line with the nihilist ethos of the project we present this latest zine by some anti-social hooligans in Bristol. It’s made up of cut-n-paste flyposters that have been spread around the city and the originals are collected here for the first time. These are not professional posters of the official movement, but dirty DIY amateur efforts about topics as diverse as police repression, eco-action, surveillance and consumerism. This is what happens when fevered twisted minds get hold of stationary and scissors. Being mainly flyposters, the zine contains pretty much no prolonged verbal diarrhea, long-winded sectarian tripe or boring pontifications posing as critical theory or whatever. appeal/higher court against Igor Shevcov and the first two days of the court hearing against the “Fenix 5”. Besides that you can find information about the case, police tactics, tips on how to support the defendants and donate and many more. Summer is almost over but things are burning up in the prisons and in the streets. All around the United States, prisoners and comrades in the “free world” are gearing up for the beginning of coordinated anti-prison actions on September 9th, 2016. In just a few weeks, the Week of Solidarity with Anarchist Prisoners begins, marking with fire the state murder of Nicola Sacco and Bartolomeo Vanzetti on August 23. 1927, turning memory into active revolt for all anarchist combatants locked behind bars today. 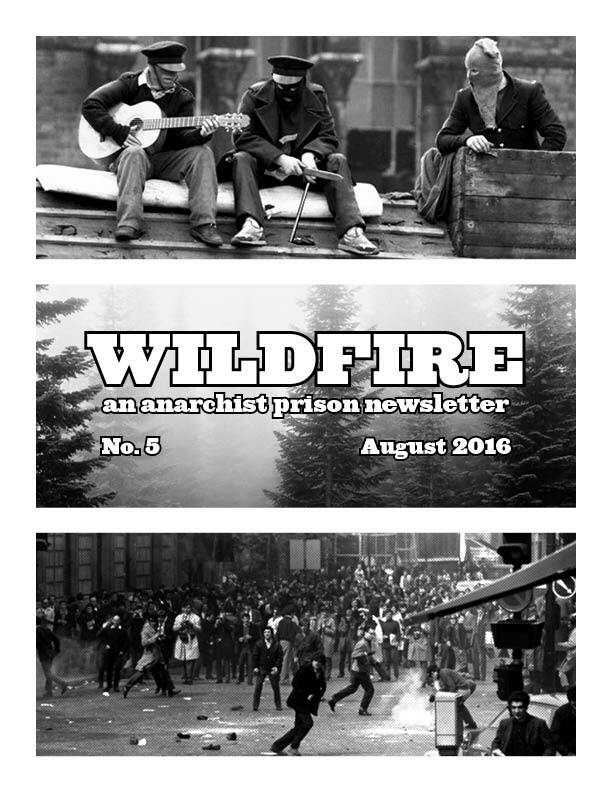 In this issue of Wildfire, comrades continue the debate on reformist action that has been raging since issue 1, bring to light the presence of queer and transgender prisoners in ongoing prison rebellions, comment on recent retaliation against police, critically discuss prisoner apathy and revolt, and give a glimpse of possibilities for September 9th. We hope that the coming months will be ones we, and our enemies, will never forget. Because we want that the difference of language should not be an obstacle in people’s communication who share passions for the liberation. El corazón palpitando, la respiración agitada, la mente clara. Los materiales necesarios: botellas, bencina, mecha y mucho más: el rostro cubierto, las miradas cómplices que se entrecruzan, la decisión tomada: enfrentarse al poder en todas sus formas y con todas las fuerzas. El humo de la barricada, el estruendo de los vidrios que se quiebran, las piedras lanzadas a los/as esbirros/as del poder, los gritos que nombran a un/x compañerx muertx o encerradx, las voces iracundas que gritan liberación. A Claudia López, compañera anarquista asesinada por la policía durante enfrentamientos callejeros el 11 de septiembre de 1998 en la población la Pincoya. A nuestrxs hermanxs Mauricio Morales y Sebastan Oversluij.